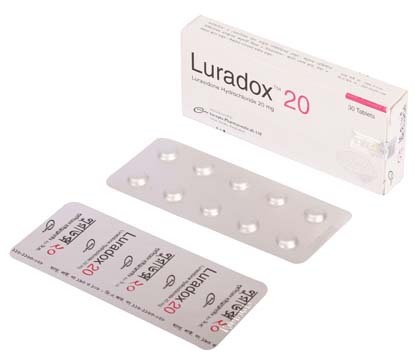 Luradox 20: Each tablet contains Lurasidone hydrochloride INN 20 mg.
Luradox 40: Each tablet contains Lurasidone hydrochloride INN 40 mg. The mechanism of action of Lurasidone in the treatment of schizophrenia and bipolar depression is unknown. However, its efficacy in schizophrenia and bipolar depression could be mediated through a combination of central dopamine Type 2 (D2) and serotonin Type 2 (5HT2A) receptor antagonism. 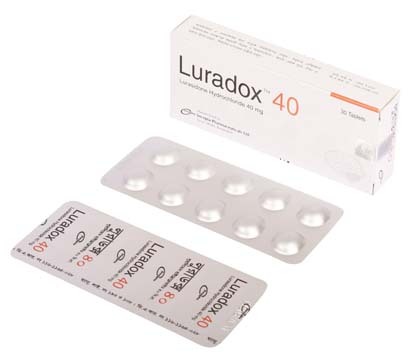 The recommended starting dose of Lurasidone is 40 mg once daily. Initial dose titration is not required. The maximum recommended dose is 160 mg per day. The recommended starting dose of Lurasidone is 20 mg given once daily as monotherapy or as adjunctive therapy with lithium or valproate. Initial dose titration is not required. The maximum recommended dose, as monotherapy or as adjunctive therapy with lithium or valproate, is 120 mg per day. Commonly observed adverse reactions are-somnolence, akathisia, extrapyramidal symptoms, and nausea etc. It can cause increased mortality in elderly patients with dementia-related psychosis, increase suicidal thoughts and behaviors in adolescents and young adults. Nursing mothers: Lurasidone is excreted in human milk. Because of the potential for serious adverse reactions in nursing infants from Lurasidone, a decision should be made whether to discontinue nursing or discontinue the drug, taking into account the importance of the drug to the mother.